The view from the rear of the upper intercooler air exit opening shows how large they really are. 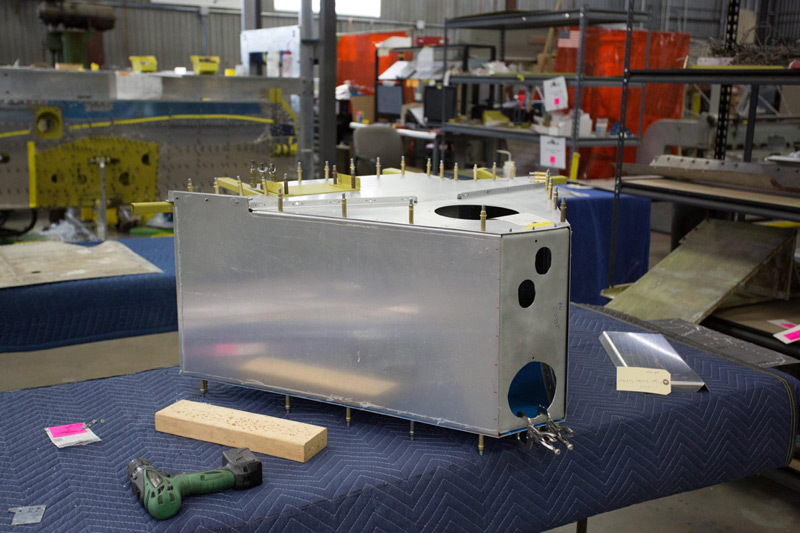 Assembly of one of the unique features of 42-27609 recently began. The 5th Air Force experimented in a number of ways to get more range out of their P-47s. One of these experiments was an extra fuel tank mounted in the turtledeck behind the pilot. It was called a Christmas tree tank because its triangular shape resembled the well-known holiday decoration..
An even more important milestone was achieved as work began on the upper fuselage. 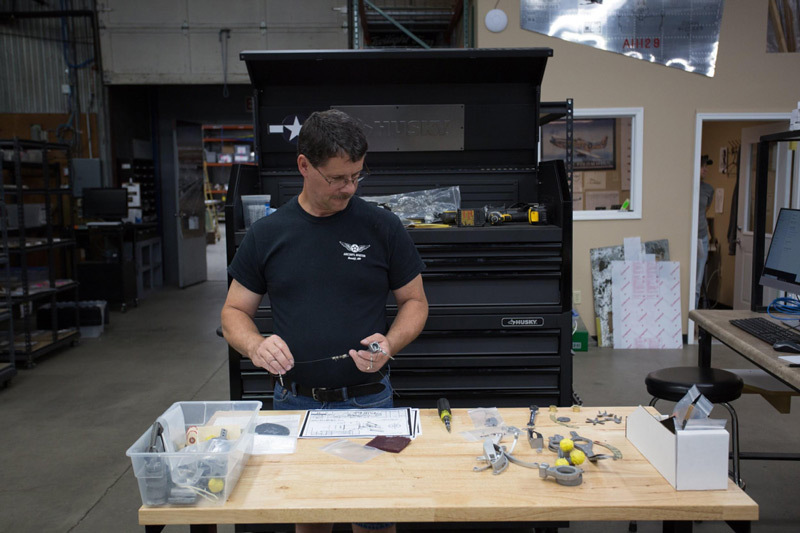 P-47 Razorback - Christmas Tree TankAaron is looking over the first tank components in the fixture. 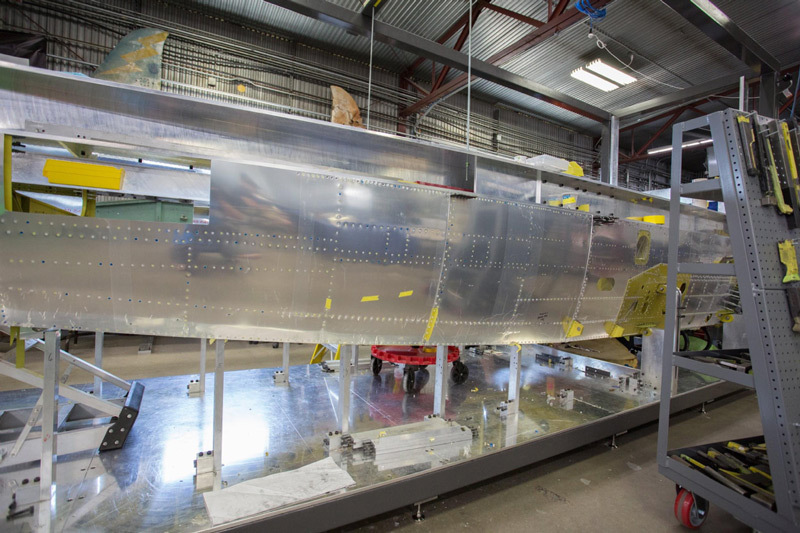 P-47Another angle gives an idea of how the tank will look when completed. P-47 Razorback - Christmas Tree TankThe top pieces of the tank and the stiffeners are clamped and clecoed on as assembly progresses. P-47 Razorback - Christmas Tree TankThe top of the tank would sit just under the peak of the “razorback” skin section immediately behind the pilot. 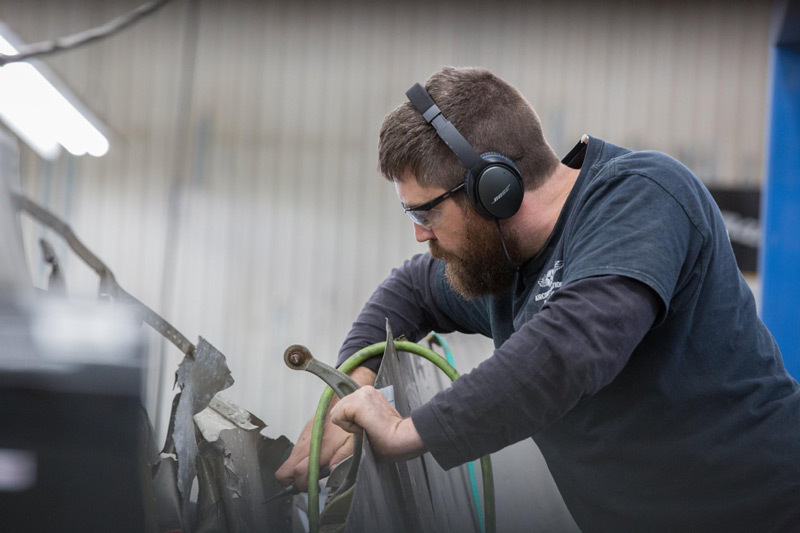 P-47 Razorback - Lower Fuselage Finishing TouchesRandy is working in the main fuel tank bay. P-47 Razorback - Lower Fuselage Finishing TouchesThis view is from the rear of the fuselage. 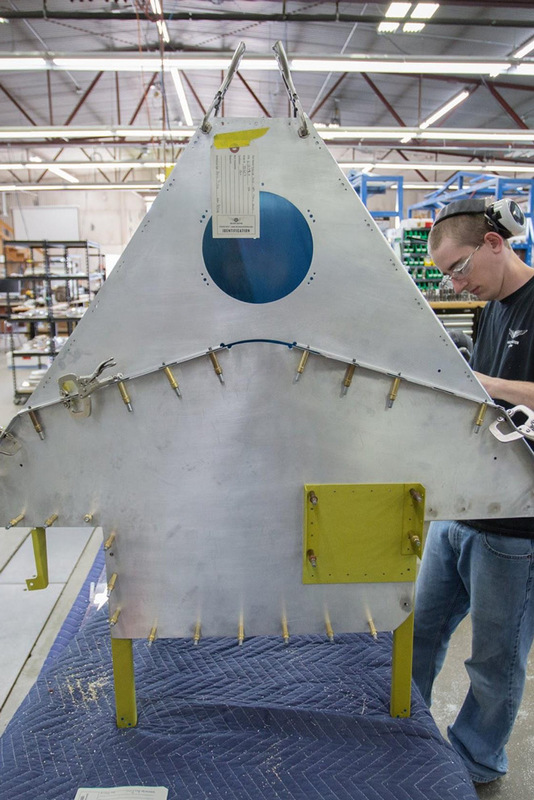 The former shown will have the front portion of the turbocharger mounting ring attached by the two holes visible on each side near the angle stiffeners. P-47 Razorback - Lower Fuselage Finishing TouchesVisible in this image once more are the two mounting holes, but also apparent is a darker green bracket that supports the turbocharger mounting ring a bit further aft. 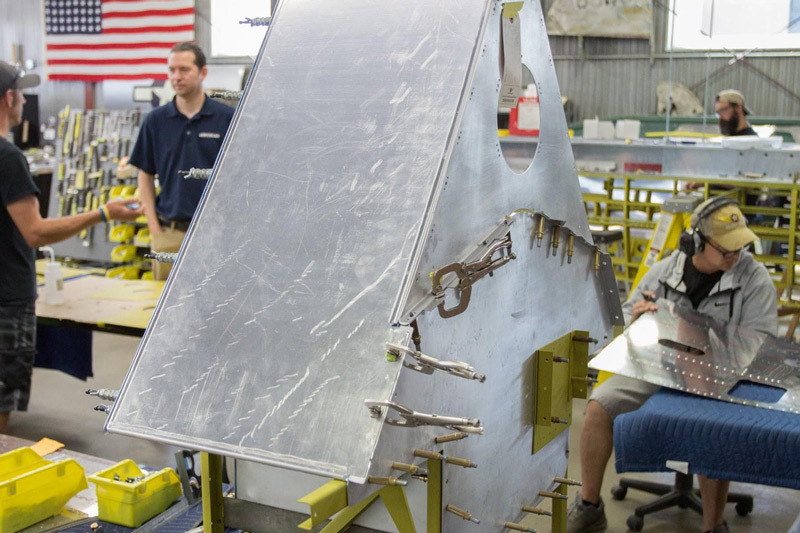 P-47 Razorback - Lower Fuselage Finishing TouchesRobb rivets on the left side reinforcing plate. This part strengthens the area surrounding the rear wing attach fittings. 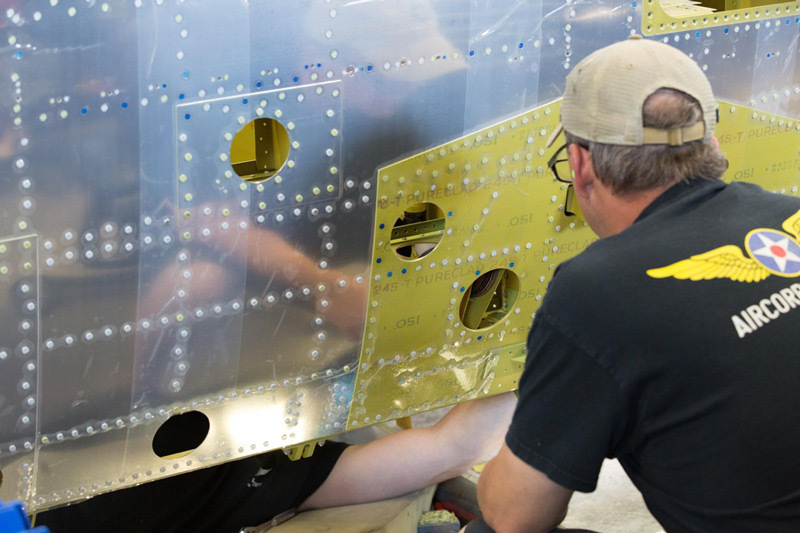 P-47 Razorback - Lower Fuselage Finishing TouchesThe right side of the fuselage skin is permanently riveted on. The Intercooler exit opening appears on the left side of the image. 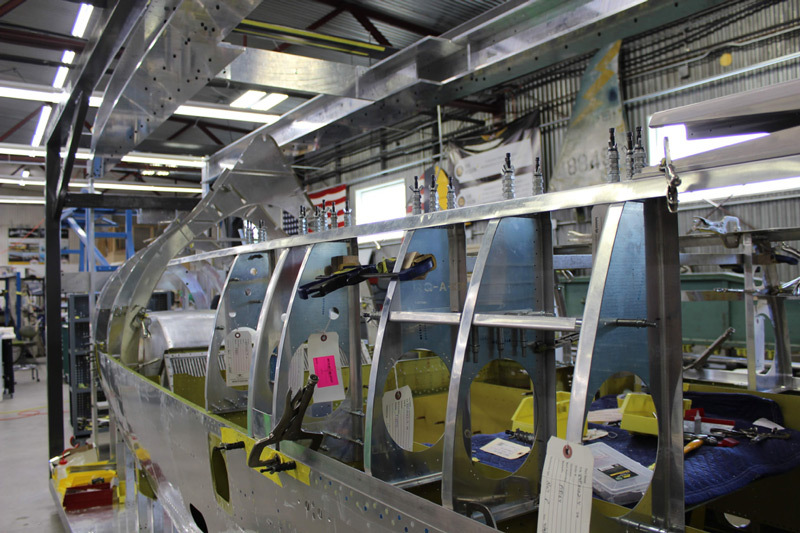 Also visible in this shot is the large horizontal fixture beam at the level between the upper and lower fuselage. 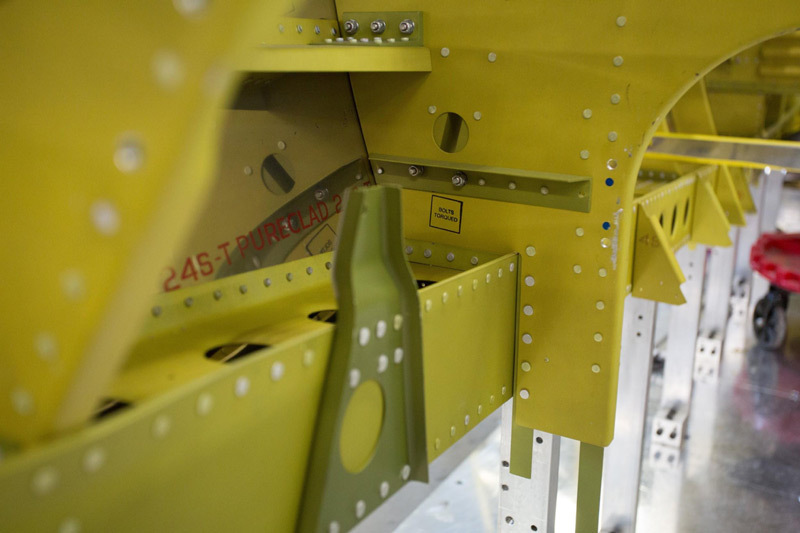 P-47 Razorback - PartsRacks of upper fuselage parts arranged by subassembly await their sequence in the restoration. 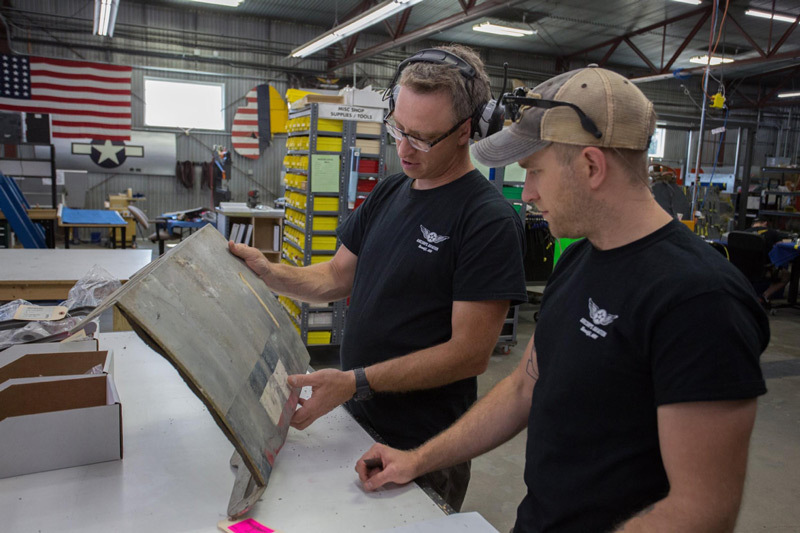 P-47 Razorback - PartsLeft to right, Lance, Ryan, and Nic examine the intercooler exit doors. P-47 Razorback - PartsThe outer side of the intercooler exit doors is visible here. 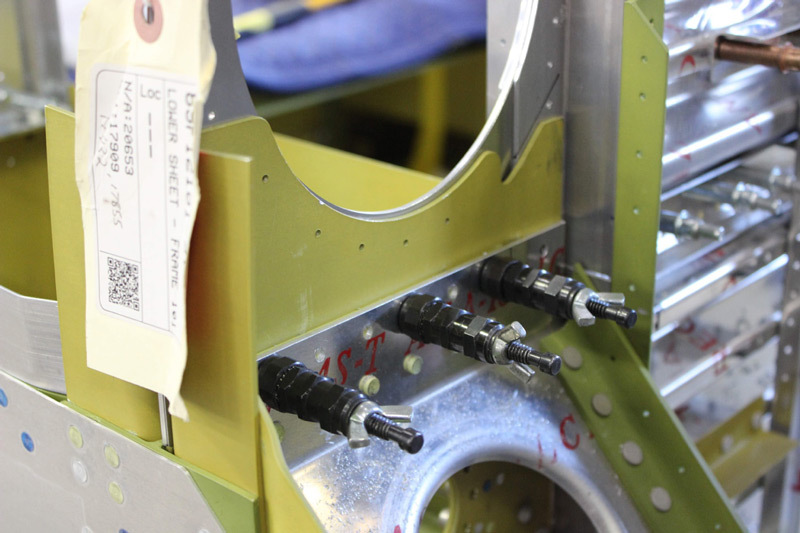 P-47 Razorback - PartsLance has the parts laid out to assemble the throttle quadrant. 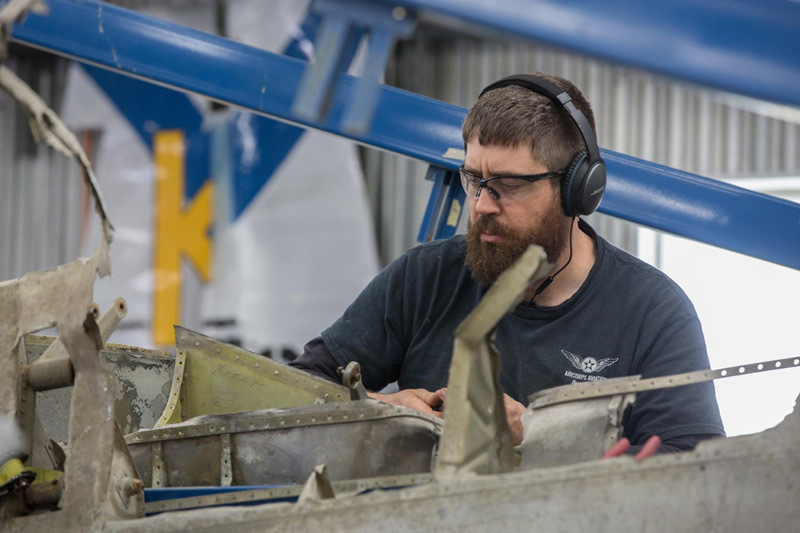 P-47 Razorback - WingsDenzil is working on disassembling the aileron attachment structures. P-47 Razorback - WingsThe part with the bearing in it is the inboard aileron hinge bracket. 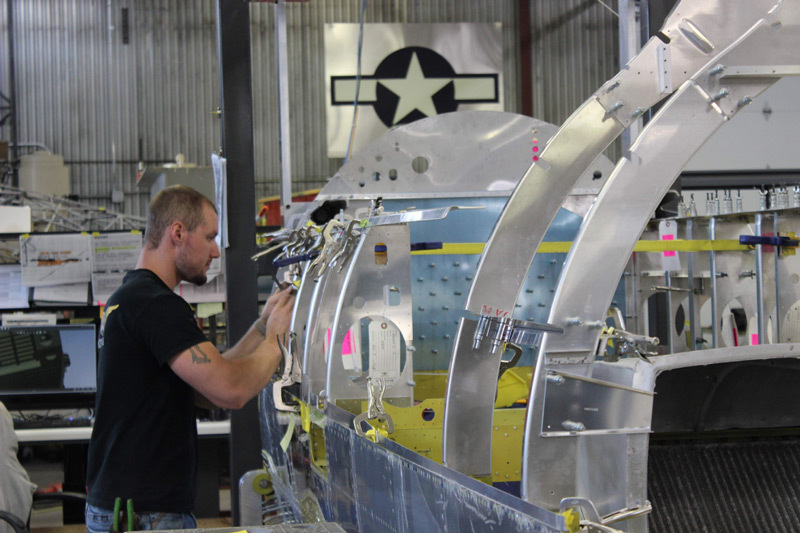 The P-47 fuselage is built in an upper and lower half. 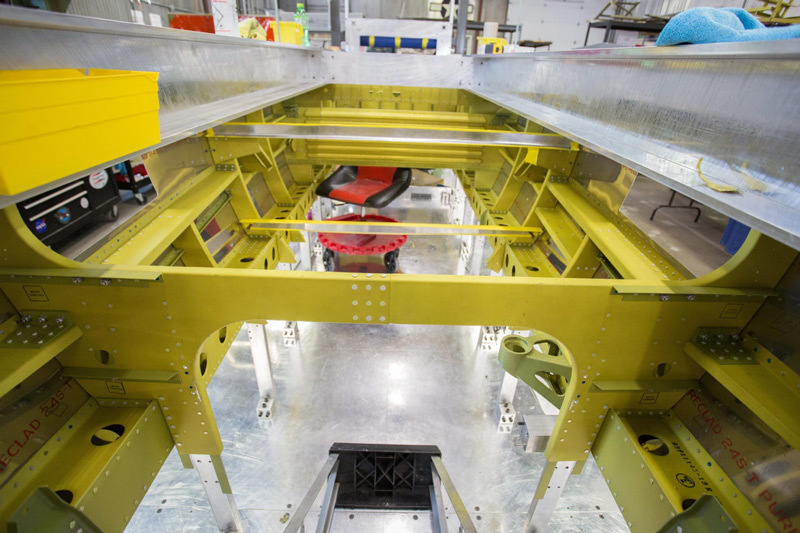 First the lower half is built in a fixture that has a heavy beam at the top of the lower fuselage. 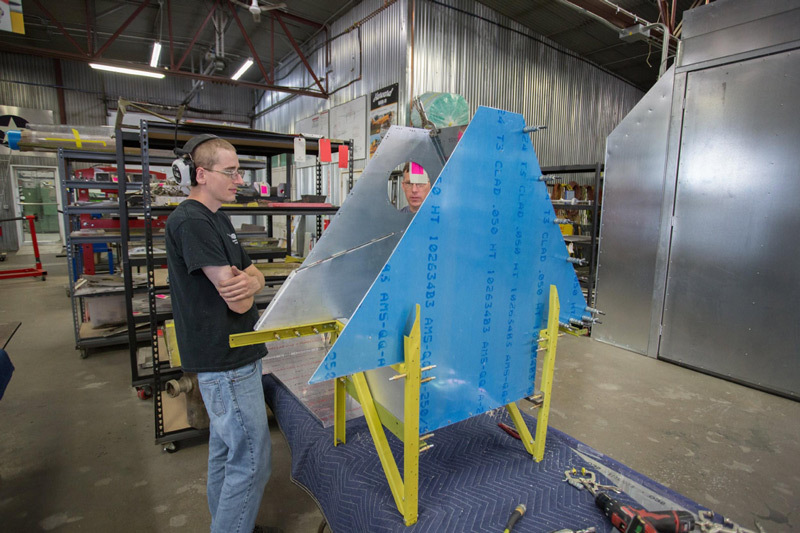 Then the upper fuselage is assembled on top of the completed lower section. 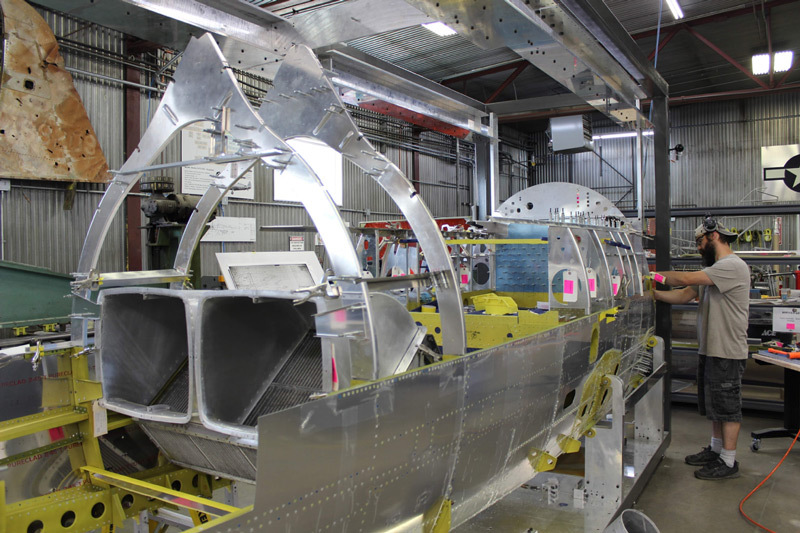 The large lengthwise fuselage fixture beam was removed this month so that work on the upper fuselage could begin. 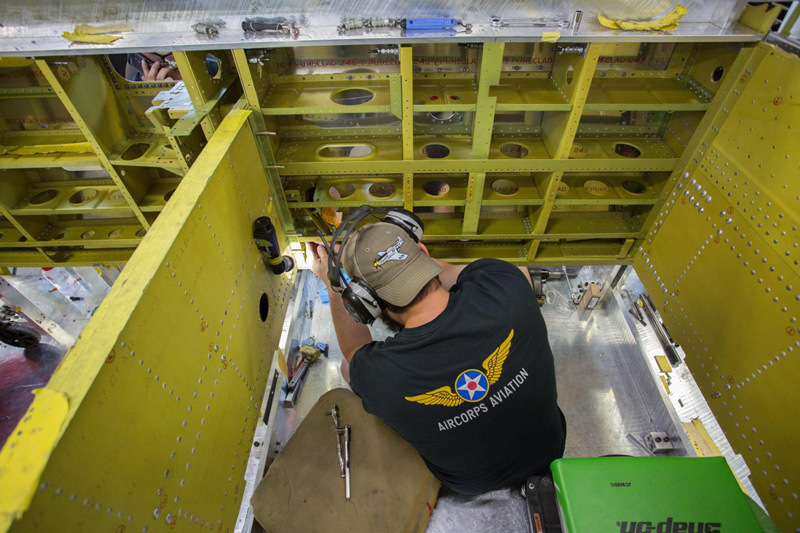 P-47 Razorback - Upper FuselageRandy is drilling to fit a part of the upper firewall bulkhead to the fuselage. Photo by Nic Johnson, AirCorps Aviation. 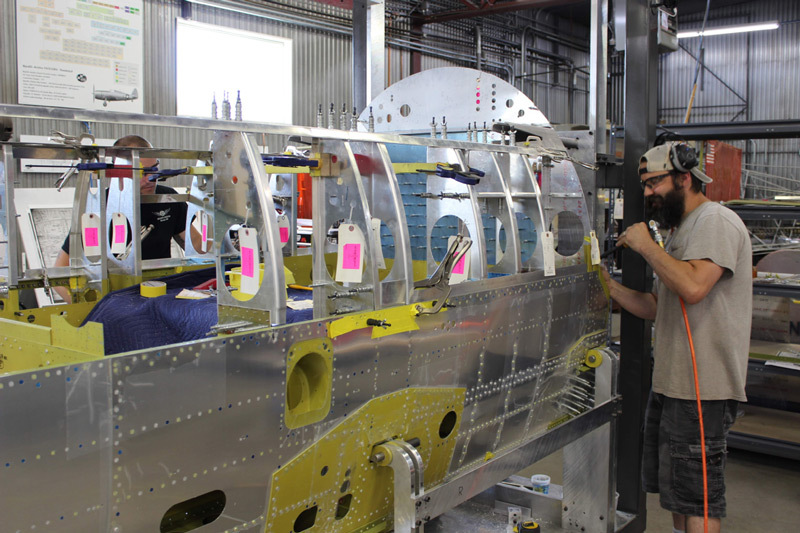 P-47 Razorback - Upper FuselageHunter works at fitting one of the fuselage formers. Photo by Nic Johnson, AirCorps Aviation. 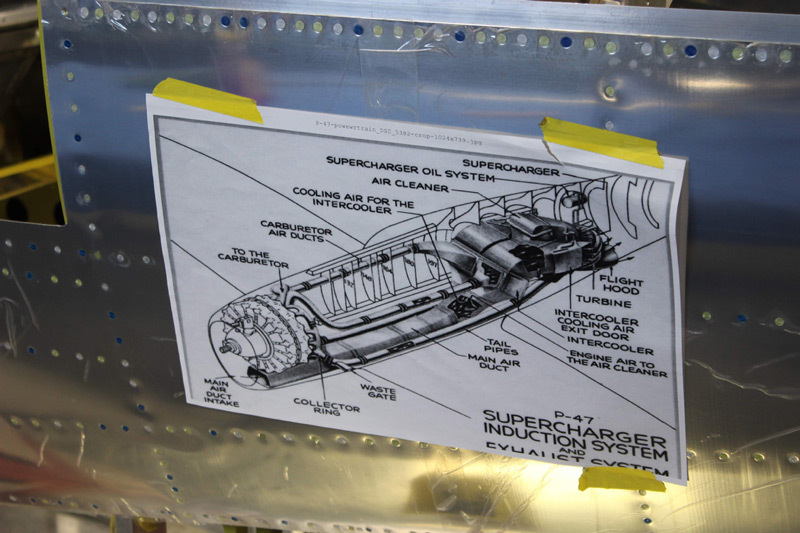 P-47 Razorback - Upper FuselageThis diagram of the complex ducting between the engine, intercooler and turbocharger helps as the assembly goes together. Photo by Nic Johnson, AirCorps Aviation. 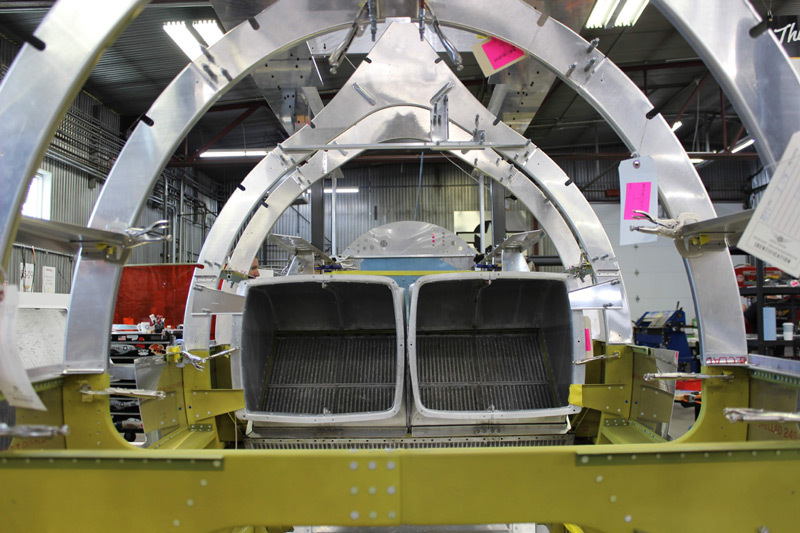 P-47 Razorback - Upper FuselageThe two very large openings will connect to the intercooler exit doors via ducting. Photo by Nic Johnson, AirCorps Aviation. 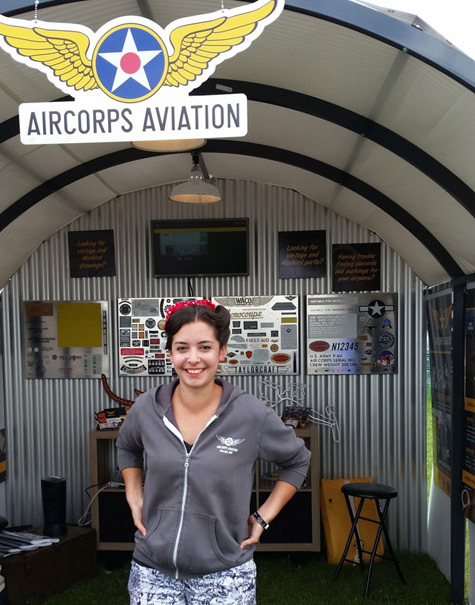 Ester representing AirCorps library at Airventure 2017. The profile subject for June/July is Ester Aube, the woman behind AirCorps Library’s continued success. Ester comes to us from Montana and is an indispensable part of AirCorps Aviation. She handles all the archived manuals and engineering drawings for both the restoration shop and for the AirCorps Library website. 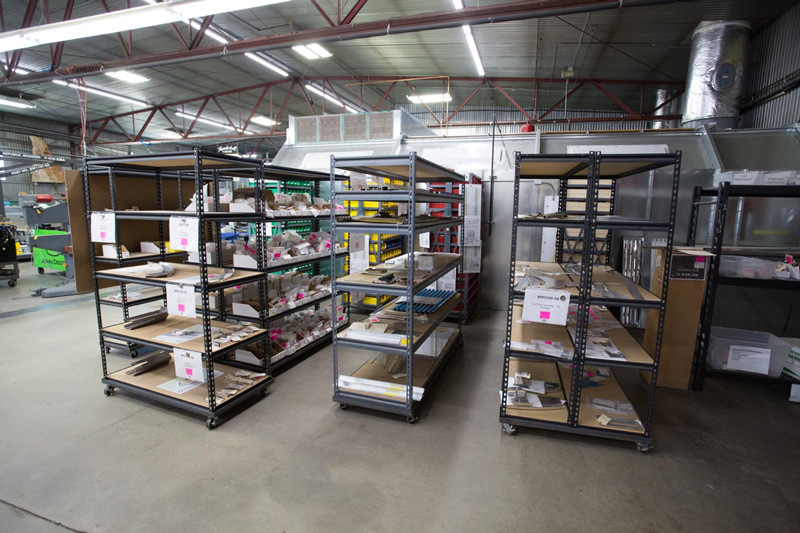 When we need to look something up, Ester’s work at organizing all this material enormously speeds up the process. The largest part of her job is digitizing these fragile 70 year old materials and it isn’t unusual for her to scan 30,000 pages in a single month. 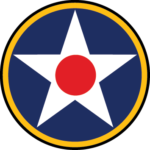 Through her work for the AirCorps Library, Ester has helped other organizations, like the Globe Swift Museum, digitally preserve their collections of original documents and drawings. Ester has a Bachelor of Science in art conservation with a minor in art history from the University of Delaware, making her uniquely qualified to handle the irreplaceable documents that warbird enthusiasts have sent her to digitize and preserve. Ester’s favorite warbird is the P-40.